The TEKEASE computer repair service guarantee provides peace-of-mind computer repair and technology service. 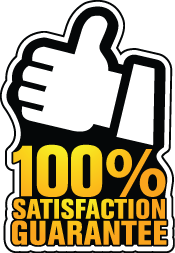 We take tremendous pride in our service and we stand behind every repair we do with our 100% Total Satisfaction Guarantee. TEKEASE computer repair service guarantee fully warrants all repair labor for 30 days from the date of repair completion. If for any reason, TEKEASE is unable to resolve your technology problem, or if you are dissatisfied with our service during, or at the time of completion, we will issue a full refund of your purchase. If a problem is not fully corrected during a repair, and if the system exhibits the same symptoms as when the system was originally repaired, we will repair the problem at NO COST or RETURN YOUR MONEY for the repair less any parts received within 30 days. If during a warranty repair, additional parts are required to complete the repair, the client is responsible for paying for such parts. TEKEASE fully warrants the parts we sell and use during the repair of your system for a period of 30 days. Repairs or replacement of such parts after 30 days will be covered by the manufacturer’s warranty if applicable. 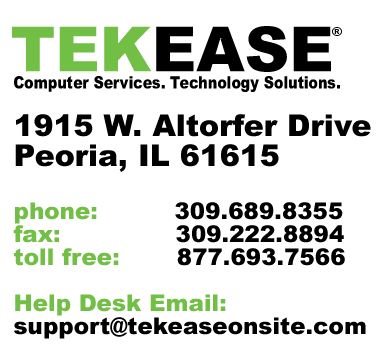 TEKEASE is not a warranty repair center for any manufacturer. TEKEASE does provide non-warranty repair and warranty repair coordination, for a fee, on any system we sell which is covered under a manufactures warranty. TEKEASE warrants the parts and hardware repair labor of all systems we build for the period of one year. TEKEASE will repair at no cost or replace any defective parts on any machine we manufacturer for one year from the original date of purchase. Problems Not Disclosed and Future Problems: If after a repair, the client experiences problems which were not originally disclosed to TEKEASE prior to the initial repair, or within 7 days after acceptance of the system by the client, the problem is classified as new and unrelated. These unrelated problems are unfortunately not covered by our Guarantee. Mechanics often refer to this as the “It’s never been right complaint.” We appreciate our clients promptly notifying us within 7 days of any such problems. If the problem is related to the repair we completed, or if we missed something, we will promptly resolve the problem to your full satisfaction. Guaranteed! Problems With Connected Devices: Certain repairs, including virus removal and operating system rebuilds, often involve the removal of drivers, network keys and other software. If the software required to ensure connectivity to the device is provided to TEKEASE at the time of service, we will warrant and guarantee its functionality post repair. If however the client does not have or fails to provide the software, it is the clients responsibility to reinstall said software and/or hardware drivers. TEKEASE will, for an additional fee, assist the client in obtaining and installing the necessary drivers. Unlicensed and/or Pirated Software: TEKEASE will not reinstall or warrant any software which has been identified by TEKEASE or the system/software manufacturer as having unlicensed, illegal or pirated software. TEKEASE will also not reinstall the software for the client. Diagnosis Fees: Diagnosis fees are not covered under the Total Satisfaction Guarantee. In other words, if we complete a diagnosis of your system and you choose not to repair it, you are not entitled to a refund for the diagnosis service. If we however we fail to repair your computer subsequent to our diagnosis and repair, you will receive a full refund including any diagnosis fee paid. Data Recovery: Due to the very nature and complexity of data recovery, data recovery services are exempt from our guarantee. However, if we are unable to recover any data, you will not pay for such services. If you wish to have a refund for our data recovery service because we were unable to recover specific data, yet wish to have what we successfully recovered, you will must choose between a full refund and receiving no recovered data or receiving what data we recovered and paying the service fee. Virus Removal: If we remove any viruses from your system and you are satisfied upon completion of the service, the sale is final. A refund cannot be awarded if you have the virus removed, and subsequently re-infect your system at any time after service is complete. TEKEASE is not responsible for your PC’s protection our users behaviors subsequent to such removal. TEKEASE does not warrant or extend the parts and labor warranty of any computer or other product we sell. In accordance with the manufacturer warranty, the manufacturer is responsible for the parts and labor repair to systems they build. TEKEASE does not provide warranty repair for any manufacturer. TEKEASE will provide non-warranty repair and warranty repair coordination, for a fee, on any system we sell which is covered under a manufactures warranty. Other Disclaimers: TEKEASE is not responsible for virus and malware re-infections, liquid damage, power damage, misuse, or any other damage not resulting in the actual repair work performed by TEKEASE. TEKEASE will not be responsible for viruses, malware or other computer hardware or software failures that occurred subsequent to any repair.